Barefoot Fresca: Out of Commission -- What a Pain in the Fibula! A couple of days ago I was an absolute wreck and could barely walk. I didn't want to blog about it because I was so discouraged I just didn't know what to say. But only a few days later and I'm feeling optimistic again, thanks to my wonderfully fabulous husband who gave me a treatment for a mysterious painful condition which came over me unexpectedly. Let's go back in time and see what happened. This past Friday my usual run was delayed because I had forgotten to put the running clothes I had washed the day before in the dryer. Oh, well, just as well. It was cold and wet outside, and perhaps by later in the day things will warm and dry up a bit. My last run had been the previous Wednesday and it had gone well. While resting on Thursday I had felt great all day, and that Friday morning I had woken up feeling great and really wanting to get out there for my Friday run. I sat at the computer to do some research while the clothes tumbled in the dryer. As I researched, I saw the sun coming out and the wind blowing to dry up the ground and was looking forward to getting out there after lunch, feeling like all was going well. When I stood up from my computer, I felt a small pain/strain below my right knee -- about three inches below the knee to be exact -- and off to the right, in the area to what I was going to learn was the fibular head region. Gee, I wonder what that little pain/strain is? I thought. I walked around, being conscious of it and trying to figure out what mechanism of action was affected by it, or related to it. Was this related to my running? If I run today will it worsen it? I guess I better skip my run to be safe, I concluded with disappointment. As I walked around, the pain grew greater and greater as time was passing. By the time I had to pick up my daughter from school, it was pretty painful and when I pressed on the spot it felt very sore at the slightest touch, like a really super sensitive and painful bruise. When I got home from picking up my daughter, I was anxious to have my husband (have I mentioned he was a chiropractor for 25 years and then went back to medical school and is now an osteopathic physician?) to take a look at the injury. But he was asleep on the couch. So, I had to wait. But I couldn't wait! The whole joy of my new-found barefoot running was threatened with this mysterious malady! I must find answers as soon as I can! Since Dr. Husband was sleeping it was going to have to be Google to the rescue! I first had to find out a name to use when googling for information. I needed to find out what the muscles in that part of my anatomy were called. If you don't have a name, you can't google well, so that's always a first step. I learned that I was experiencing pain in the peroneous longus muscle. But my search after that was not going as well. Most of the running or athletic injuries I could find related to the peroneous longus muscle were involving the tendon at the bottom of the muscle near the ankle. I couldn't find anything where there was muscle strain at the top of the muscle below the knee. The closest I came was this discussion from some running message board somewhere in the world: "Peroneous Muscle -- Strain??" The answer they were coming up with ranged between the problem being with having the right running shoes, to peroneal tendinitis, or -- most horrible of all -- the dreaded stress-fracture-in-the-fibula. That really did it! I was officially scared. I was sure that my overweight running had led to too much strain and I now had a stress fracture of the fibula bone. You don't know how frightened a wife can make herself out there on Google while her husband is sleeping. Since he never woke up from his nap, I had to leave for a school function that evening before I could ask him anything about it. The pain just got worse and worse while I was out. I had to hobble and limp so slowly and grab on to things to help me get anywhere because I couldn't bear any weight on my leg. When my husband, who was now awake, saw me, I poured out my worries on him. "I saw you had been reading about the peroneous longus muscle, " he said, "but I have a feeling, from what you describe, that the problem is not in the muscle but in the joint." He did a little examination. He had me put my legs straight out in front of me and flex my toes, and tell him if it hurt. Then I had to point my toes and tell him if it hurt. I already had figured out that dorsiflexion of the toe was directly connected to the painful spot. I had also figured out that any weight put on my forefoot and toe area while dorsiflexed -- the position one would be in while "toeing off" -- caused excruciating pain in the area below the knee that was affected. He said with confidence, "yup, that's coming from the joint. I will give you an adjustment tomorrow because it's too late tonight." That night was spent in a lot of pain. I could not find a position which did not trigger the pain. I ended up taking some Advil, which helped a little. I hoped so much that I would be a little better in the morning -- but I was not. I was much worse. I had become a cripple overnight. I didn't have time for the osteopathic manipulation in the morning because I had to bring my daughter to an appointment. As I feebly limped out the door, wondering if there was an old pair of crutches in the attic, or if I could borrow grandma's walker, I heard my husband tell me not to worry. He was going to fix the problem. I was pretty unhappy when I got to the plaza where a few weeks back I had wrote that I had gone for the spontaneous run. How carefree I had been that day! How daring! Had I really just up and gone for a barefoot run spontaneously like that such a short time ago and here I now was an absolute cripple? How did I go from something so wonderful to something so immobile in such a short time? Well, the happy news is that when I got home, my husband was ready and waiting to take care of the problem. He had his adjustment table out and had researched the techniques for the injury I had. He told me that it was called "anterior fibular head somatic dysfunction." He showed me on his bone model how the fibula bone is aligned, and how it can get knocked or pulled out of alignment and cause problems. The problems come from the nerve where the fibular head has gotten displaced. I was a little confused about the nerve thing. Was it compressed or pinched? At any rate, he said that everything in the surrounding area would be affected and that's why I felt the pain in the muscle. He also told me that this condition is often misdiagnosed as a knee injury. That was a shame, he said, because it is easily fixed with osteopathic manipulative therapy, but they probably go on to even try to correct it with wrong treatments, since the condition is not well recognized. That's part of why I'm writing about it here. Perhaps there will be another person googling someday who might find this information helpful. Anyway, his treatment consisted of using my foot as a lever to twist the fibula bone back into it's proper alignment. I had to lay face down on the table and put my foot up. He got my foot into a certain position and then I had to press while he twisted a little to adjust the bone. After that he used his little trigger point tool to do some trigger point therapy in the sore place in the peroneous longus muscle. Since it was so incredibly tender and hurt just to ever touch it lightly with my fingers, it was very painful to get the treatment and I could barely take him digging that little wheel into the spot. But he made some comment about me being a wimp or something and that kind of helped me get through it. I was considerably improved immediately following the treatment. Although there was still tenderness and soreness, I now could walk around. I walked with a limp, but there was no doubt that I was improved. As the day progressed I got better by the hour. It seemed miraculous to me. My husband kept checking in with me: "How's the leg?" from time to time to see how it was progressing as I went about my day. Every time I answered that it was improving, he smiled a quite self-satisfied smile. That night I was able to rest comfortably with no pain except if I tried to lay on my back. The next day, the condition continued to improve throughout the day, although I still needed to limp. "Stop worrying," he said, "you are doing well and you will be able to run." "But ... will I be able to run in the Disney 5K in January?" I asked him. "Yes, in fact you'll be able to run by Wednesday probably. You may need one more adjustment before that." Well, when I woke up today, Monday, I can definitely tell that there is a possibility that I will be able to run Wednesday. It is remarkably better. My husband is going to give me another osteopathic manipulation tonight, so I will keep you posted on developments. This post has been so long that I'm not going to tell the rest of the story, the part where I try to figure out what exactly got me into this situation to begin with. I will have to save my theories on that for another post. Please stay tuned for Part II: "What Caused This Condition?" In the meantime, if you ever have pain in this area, I highly recommend considering the possibility that it could be an anterior fibular head somatic dysfunction, and consulting a knowledgeable osteopath (ideally one who works in sports medicine) for osteopathic manipulative therapy options. Hope to see a happy running post from you this Wednesday. Crazy stuff! Take care of yourself! Ewa -- Very interesting observation. Alas, one definitely couldn't take this incident as in an indicator of the whole. Still, it's good to know maybe I do it right sometimes. You know I've never heard of that! But who's to say that because we barefoot run we won't ever get hurt?? Although I feel like my shod friends are standing by waiting for that. Hang in there!! Mamaruns -- I am convinced that this injury was not caused by barefoot running. Not that it couldn't have been, but in this case I do not think it was the cause. Even if barefoot running was the "cause" of the injury, I don't think it still would have been the cause of the injury. I think it would have been some kind of misalignment or poor form. What doesn't always get emphasized it seems, is that it's not really barefoot running or shod running that causes injuries, it is the way our body is working because of being barefoot or shod. It is the alignment and mechanics being off somehow that leads to injuries. Either those of overuse, from repetitive loading on a poor alignment, or of trauma, from slamming down in some incorrect position. If this misalignment of my fibula had been caused by barefoot running, IMO it would have happened because something was wrong with my form, or I mis-stepped at one point or something (like twisting an ankle on a rock) and not because I was barefoot. Well said in the comment above. Glad you're feeling better! Thank you! I just went through this myself. A massage therapist said my fibula was out of alignment. I found your post with a google search and read that it could be adjusted back in. So I made a chiropractic appointment and he was able to put it right back in. It was a surprisingly loud pop, but didn't hurt much. I was face up for it, so there are different approaches that work. My feet suppinate and are too weak for barefoot running. I wear custom orthotics and high stability Asics. The messed up fibula exhibited itself in a strained toe joint and possibly a stress fracture in the toe. The chiropractor said it can also cause ankle pain. SocialDancer, I am so happy to hear you found this post helpful to you! Wow great post! 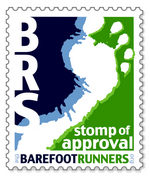 I am a personal trainer and have been dabbling in the barefoot running over the past couple of years. I hate to say it but it's been nothing but injuries since. I have been experiencing a similar problem so now when go see the Chiropractor I'll be sure to mention your experience. Hopefully it helps me so I can at least get back to running. I happened upon your blog entry after many tries at naming symptoms - mine sound like a minor version of yours. The cause of "poor form " while running might fit my incident. Does kicking off one's right flip flop while running to jump in the pool to escape a swarm of yellow jackets sound like a possible cause :). ? It has been two weeks now but my chiro appointment is in two more days. Fingers crossed. Yes, the two posts were long, but in searching for a solution, perhaps it was worth it. Thanks to you and DH!